Racecadotril is indicated for the symptomatic treatment of acute diarrhea in adults when causal treatment is not possible. If causal treatment is possible, Racecadotril can be administered as a complementary treatment. Adults:One Racedot™ 100 capsule initially, then, one Racedot™ 100 capsule three times daily, preferably before the main meals. Treatment should be continued until two normal stools are recorded. Children: 1.5 mg per kg body weight per administration, three times daily. Elderly: Dosage adjustment is not necessary in the elderly. Caution is advised in patients with hepatic or renal impairment. 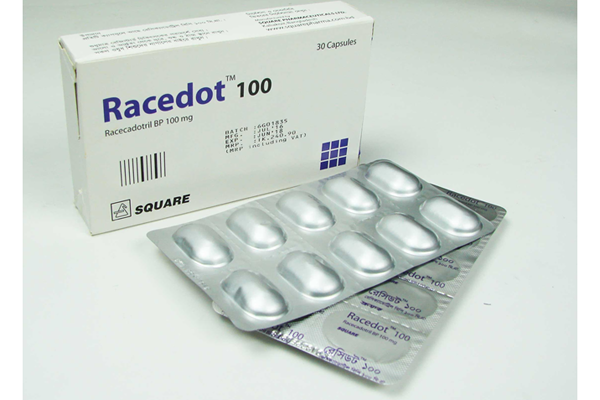 Racedot™ 100 Capsule: Box containing 30 capsules in alu-alu blister pack.